Police have charged seven teenagers in the organized theft of iPhones from two stores at a mall in Lethbridge, Alta. On Friday at 8:30 p.m., a group of five teenagers dressed in winter clothes entered i-World in the Park Place Mall. Nine iPhones were stolen from the store in under a minute, police said in an emailed release. They then left the store and went to Staples in the same mall, where they threatened a staff member and stole two more iPhones, police said. Witnesses saw the group run through the parking lot, jump a fence and run across Highway 3. Shortly after, they returned to the mall, where they were picked up by a waiting vehicle. Police followed the vehicle to a parking lot and the teens tried to get away on foot but were taken into custody. Police said the seven teens arrested were either part of the group that entered the stores or were the lookout or getaway driver. Eight of 11 stolen cellphones were recovered. 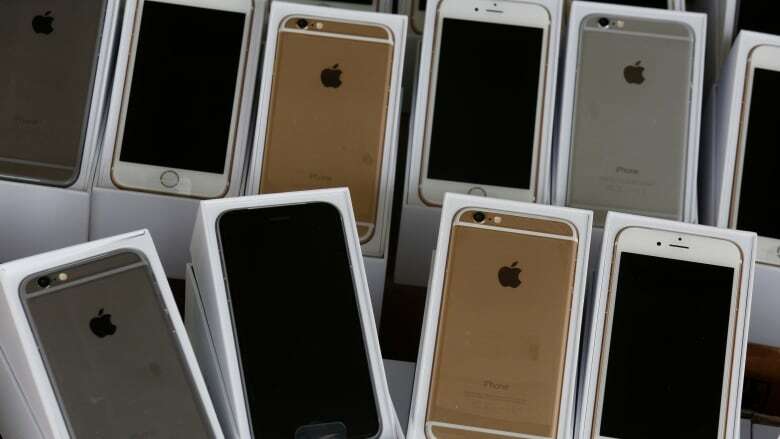 The total value of the stolen phones was approximately $13,000, police said. The ages of the teens, who can't be named under the Youth Criminal Justice Act, are as follows. Two 13-year-old males from Calgary. A 14-year-old male from Calgary. A 17-year-old male from Calgary. A 15-year-old male from Lethbridge. A 16-year-old male from Lethbridge. A 17-year-old male from Lethbridge. Each teen was charged with conspiracy to commit theft over $5,000 and conspiracy to commit robbery. All have been released from custody. The 13-year-olds are due to appear in court on Tuesday, and the rest will appear in court Nov. 28.